A nifty little game from the designer of Catan, this is a much more punishing experience. It takes careful planning to make sure your Domaine isn’t chewed up, swallowed whole or engulfed by the other players, and defeat is very, very often snatched from the jaws of victory with a sneaky play that will leave your friends seething. Place borders, recruit knights and negotiate with your fellow barons to protect your resources. 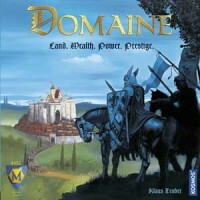 Add a Review for "Domaine"